Think of that outrageously talented friend or colleague or family member in your life who is truly a Renaissance man or woman…you know, the one who is just so great at so many things from tennis to yoga to coding to playing the cello, and is a complete fountain of knowledge for everything from fixing dishwashers to knowing which Goethe poem is the best? 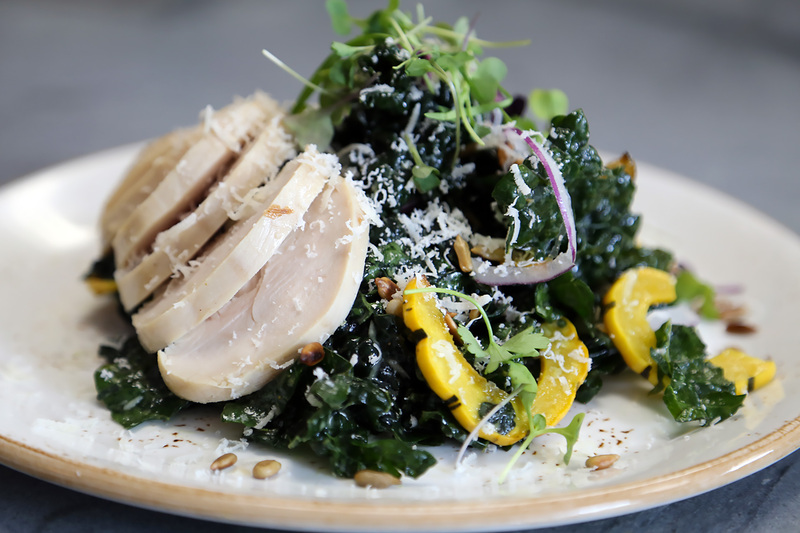 Well, as far as restaurant-market-café-larders go in San Francisco, the closest equivalent is Merchant Roots, an eminently charming addition to the State Bird Provisions side of Fillmore on the thoroughfare’s rapidly growing dining stretch south of Geary. It’s impossible to give a blanket label for this concept, long in the making by business and life partners Ryan Shelton and Madison Michael. There really is nothing quite like it in the Bay Area. You can come for a homemade scone and a cup of coffee at 9am. You can feel free to drop by for a plate of pasta (yes, homemade) and a glass of Prosecco to treat yourself to a late afternoon lunch feast. You can pick up a kale and chicken salad or a sandwich (on homemade focaccia, obviously) to-go en route to catching the 38R on Geary. You can buy dry or wet pasta for dinner at home and pair it with a bottle from the under-the-radar wine boutique that is tucked in the far corner of the tiny Merchant Roots space. 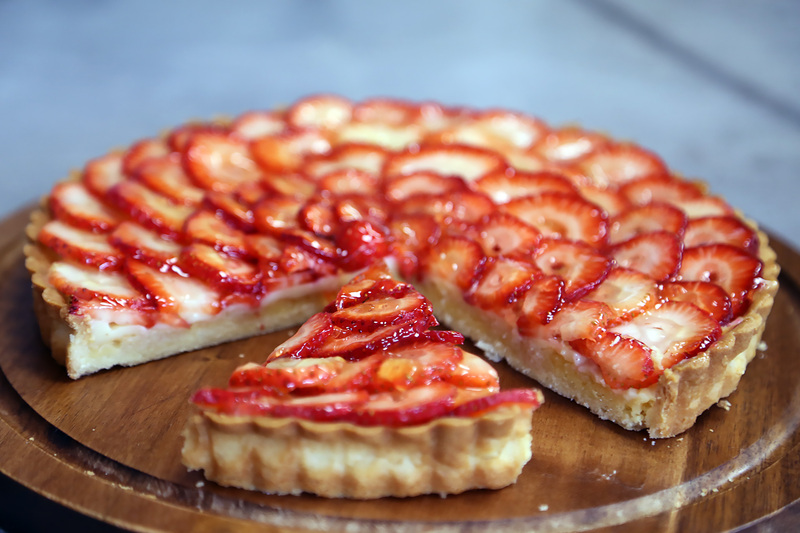 Then there are homemade soaps, sipping chocolate mixes, homemade jams, freshly baked quiche slices…we could go on. Then the next stage of the project, The Table at Merchant Roots, comes in a few weeks as the next marquee tasting menu for a rapidly growing category in San Francisco, except this one might be considered the most whimsical — and intimate — of the elite bunch. All of this resides in a 1000–square foot space that somehow manages to feel spacious and not seem cluttered whatsoever. Yes, it’s all pretty overwhelming but also so relaxed and calm when you step inside. The closest comparison for Merchant Roots is Chef’s Table at Brooklyn Fare in New York, a casual shop in the daytime and ambitious tasting menu in the nighttime hybrid that has received global accolades for its inventiveness. Healdsburg has SHED but that so-called “grange” is about 10 times bigger than Merchant Roots and has a twee-bucolic lifestyle theme that strikes many as precious with its fermentation lab, quinoa salads and rather pricey kitchen tools. In the end, they’re vaguely related but really hard to directly compare. 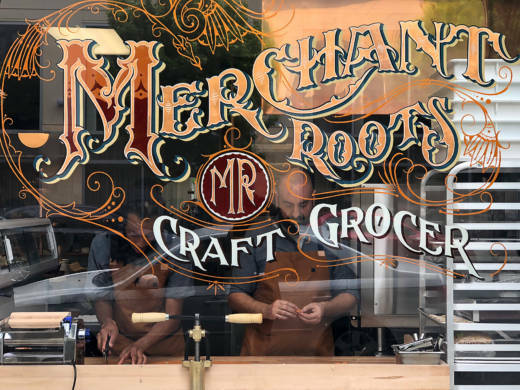 The first thing every guest notices while walking by Merchant Roots is the window’s eye-catching hand-painted sign by Bay Area artist Ken Davis that sets the tone for the shop’s contemporary interpretation of retro design inside. It could easily be a sign for a blacksmith shop in the Wild West, but also seems hip. It’s timeless and elegant cursive with artistic flair. 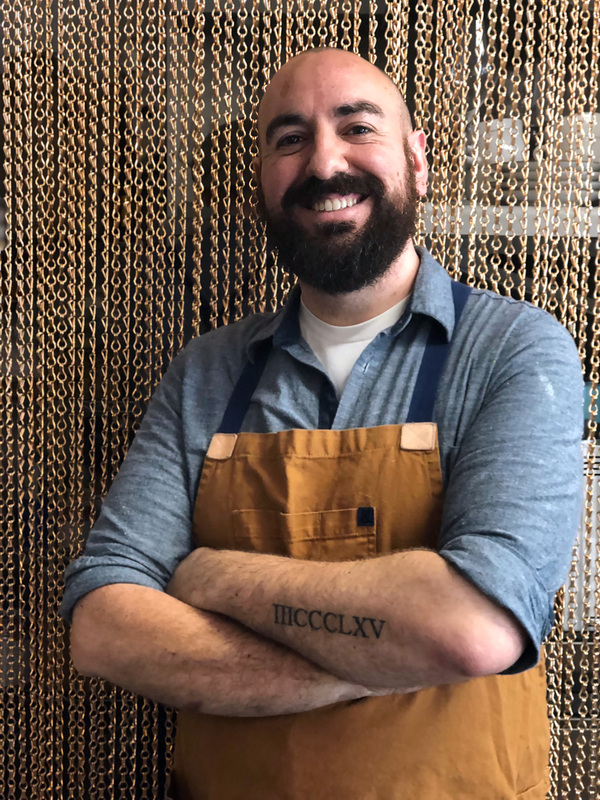 Then your eyes wander past the sign into the actual window where sous chef David Hamilton-Kidd will surely be rolling out pasta dough or cranking dough through the Torchio hand-press pasta maker. Fillmore pedestrians stop by, planned or unplanned nowadays, to watch the pasta making process like how people go window browsing around Union Square come Christmas time. 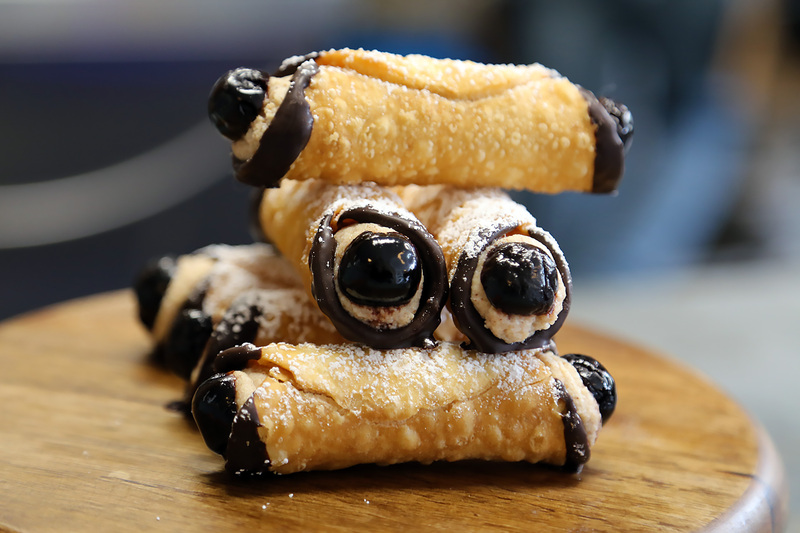 After stepping inside, chances are high that your attention will immediately drift towards the gorgeous pastry case, where immaculate chocolate-drizzled cannolis with Luxardo cherries dramatically peeking out of both ends and chocolate-dipped almond and anise biscotti ($3) beckon. You might be tempted by a muffin version of carrot cake with a ricotta cream cheese stuffing ($4) on one day and then a perfect slice of springtime via a strawberry and almond cream tart ($6) on the next visit. There usually will be doughnuts, perhaps a simple old-fashioned on one pedestal and a coconut-lime one made of mochi and milk dough, dusted with coconut flakes and lime zest ($3) on another. Upon press time, the bakers were still perfecting a gluten-free brownie recipe but you can count on that being a major hit when it premiers soon because this town sure loves it’s gluten-free treats that actually taste as good as their flour-filled equivalents. However, the showstopper of the crew is the chocolate chip cookie ($3) that takes the chocolate part very seriously. 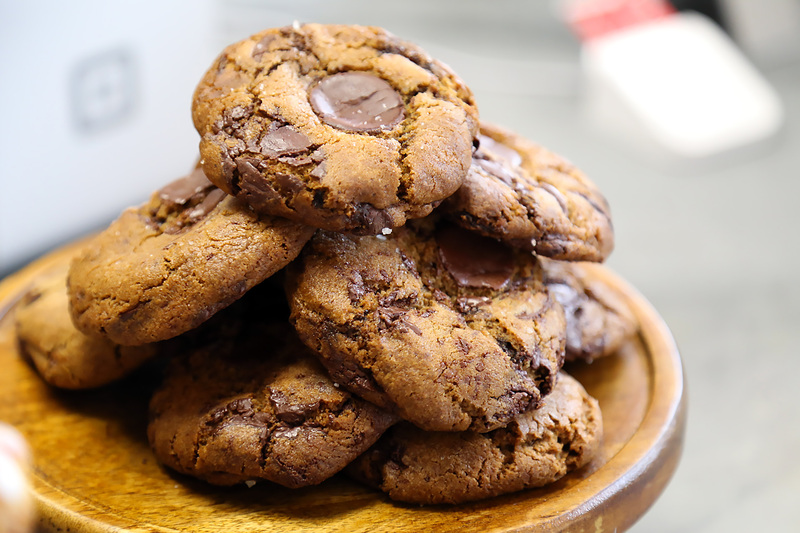 It’s Michael’s recipe and she is adamant about making sure that the cookie is thick and soft, but not overly doughy or cumbersome, with a just a smidge of crunch at the outer edges. You’ll certainly taste the butter in the cookie — there’s a lot of it. But, what you probably didn’t guess is that it’s actually brown cultured butter mixed with equal parts muscovado sugar and regular sugar that give it a certain alluringly sharp sweetness. The other major catch with the recipe is that Michael insists on the composition being more chocolate than cookie. That means there should be about 1.5 Guittard dark chocolate wafers per cookie but you’ll see some cookies where that figure looks more like 3. Nobody will complain, though. A finish of fleur de sel tops what is no doubt going to be a contender in the competitive “Best Chocolate Chip Cookie” debates of San Francisco. Cookie Monster strongly approves of this new entry. There is nothing wrong with having muffins and cookies for lunch but you’ll need real lunch food at some point. 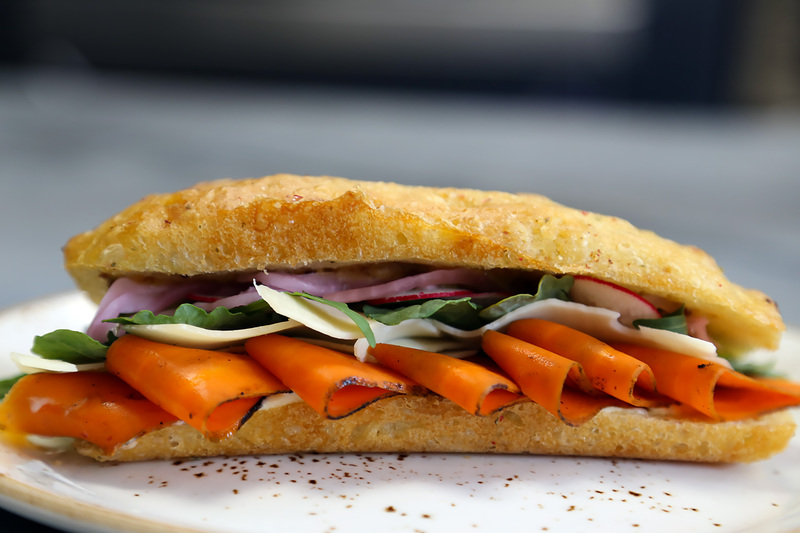 The aforementioned housemade focaccia serves as a base for a pair of sandwiches (termed sando) ($9). One is a fascinating shaved pastrami-spiced smoked carrot number where the shaved vegetable looks like slices of lox and comes with Pt. Reyes Toma cheese and raisin jam. That same semi-hard cow’s milk cheese from Marin joins tangy mortadella slices with arugula and Bavarian mustard in the other sandwich. Both are simple, precise and filling without being heavy. Salads include ever-trendy kale leaves lightly coated with preserved lemon vinaigrette. Shelton finishes it with chicken and Parmigiano Reggiano for a satisfying but virtuous midday meal ($13; $10 without chicken). Moroccan chicken salad is a completely different styled offering ($14) and brings together cashews, crispy chickpeas, yogurt and citrus-mint vinaigrette. 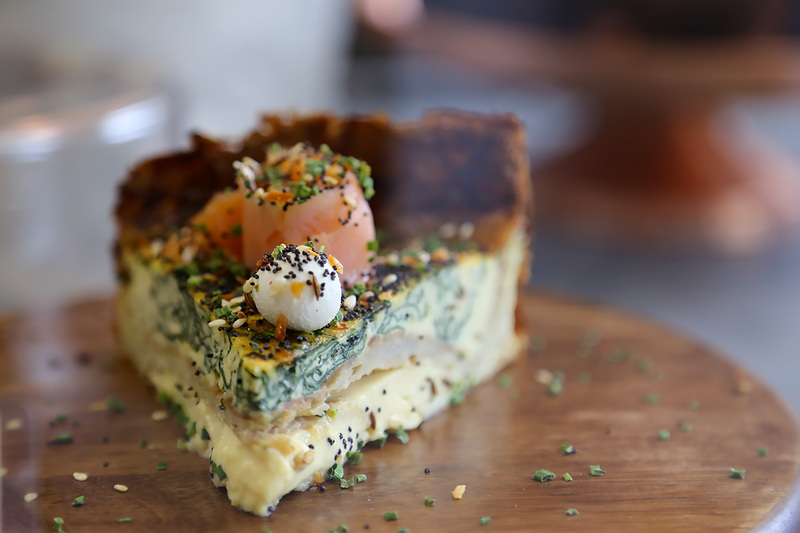 Venturing beyond salads and sandwiches, Shelton has a little fun with an “everything” spiced, cream cheese and smoked salmon-topped quiche with a potato crust ($12). It’s a bagel and latke-minded quiche. Somebody is having fun. 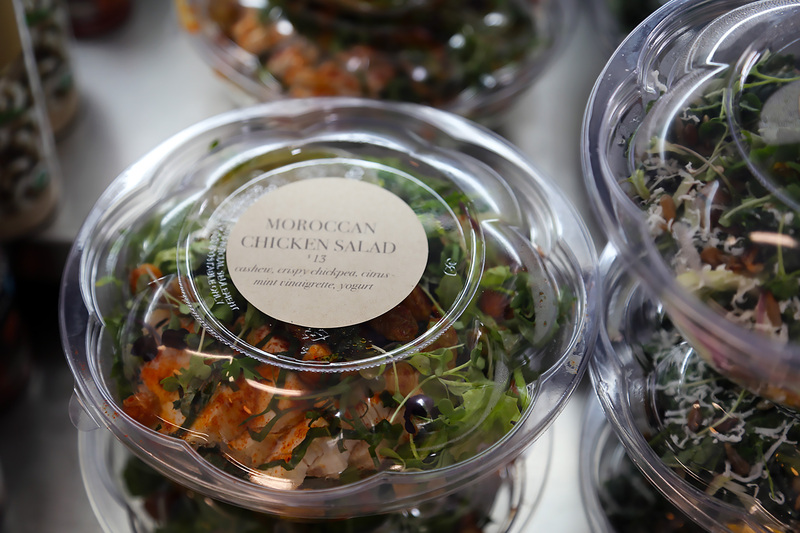 Salads are packaged to-go and all of them and the quiche are also available for enjoying plated in the café. Sandwiches, meanwhile, are all packaged to-go but can be consumed in Merchant Roots’ environs, along with being toasted on the spot. 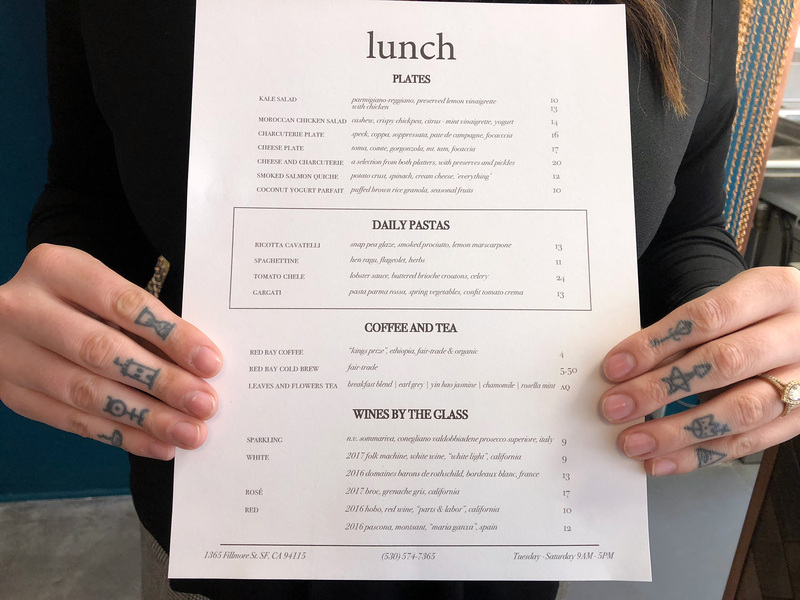 It’s a smart idea to have flexibility between takeout and eating-in because the lunch crowd can vary in a more residential-centered strip like this one. Future plans also call for a breakfast sandwich and a fried mortadella sando meant for dining in. If you’re lingering for lunch, though, the must-try house meal really is the pasta, as the pasta making in the window might suggest. It’s Shelton’s specialty and one he has been fanatical about for life since being a boy growing up in San Jose as part of an Italian-American family. The enterprise could simply be Pasta Roots (or Semolina + Water?) 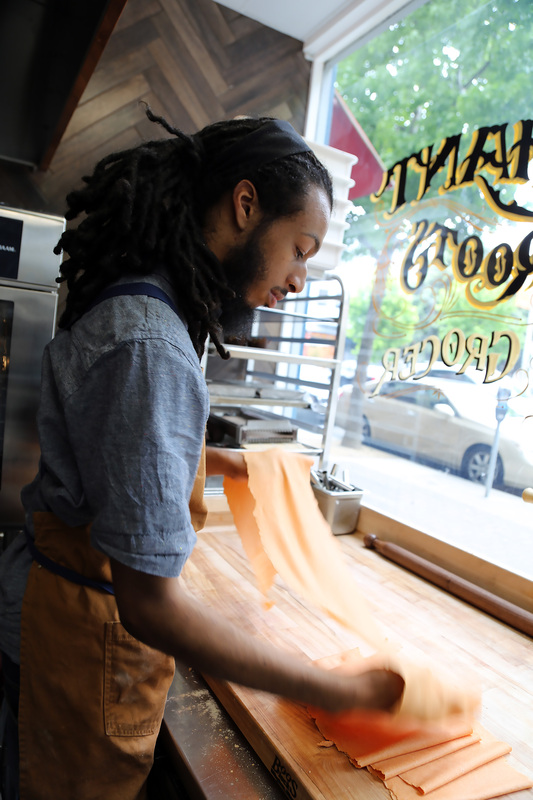 for how important pasta is to the operation and how skilled Shelton is at it. San Francisco is a pasta-crazed town as is proven by the dozens of Cal-Ital restaurants and even more informal red sauce and pizza joints. But, who makes their own dry and fresh pasta, pairs it with homemade sauces for enjoying in-house, and also sells both the sauces and pastas retail for you to make your own version at home? It’s definitely a tiny niche and this is a welcome addition to the diminutive club. 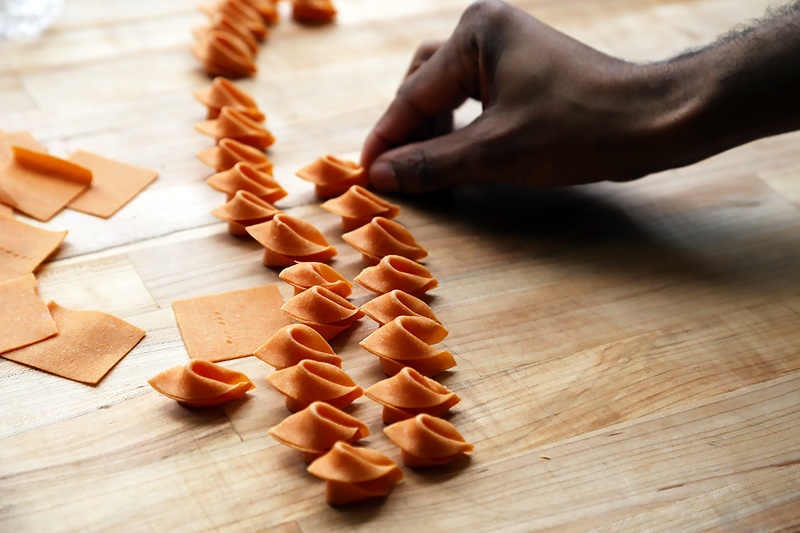 You’ll find a handful of pastas each day on the “daily pastas” menu for freshly prepared lunch dishes. 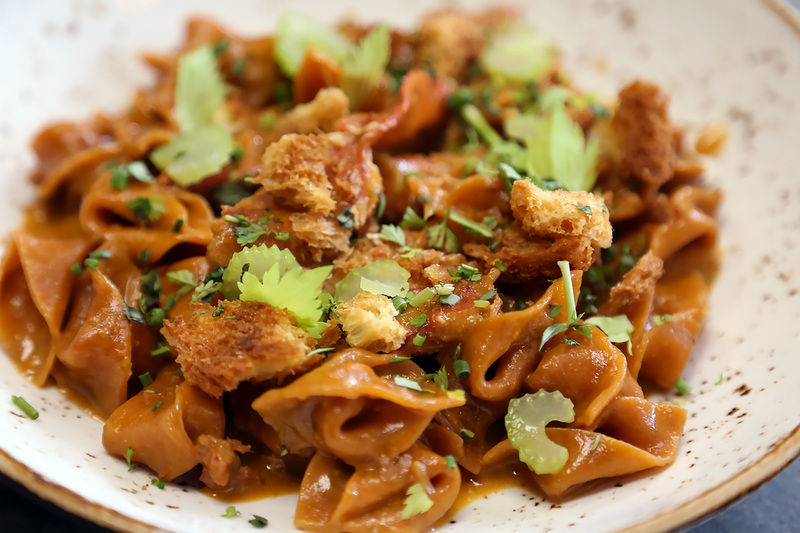 The early must-order is tomato chele ($24), shaped similarly to an unstuffed small tortellini, with just the right amount of indentations and curves to hold its sauce teammate, a lobster reduction made from the juice of lobster heads where their tails have been used as meat. Shelton finishes the dish lobster roll-style with curls of celery and buttered brioche “croutons” evoking the roll’s usual hot dog bun. Of course, the brioche is homemade, being surplus brioche from doughnut dough. Elsewhere in the pasta neighborhood, spaghettine made on the chitarra (like a small string harp) is joined by hen ragu ($11), while ricotta cavatelli are snap pea-glazed and accompanied by lemon mascarpone and smoked prosciutto ($13). Gargatti (think short caterpillars) comes with spring vegetables and a confit tomato crema “parma rossa” sauce ($13). Sometimes there is even chilled pasta like gnochetti with pesto, roasted peppers and red onion ($9). Eventually, Shelton will be serving his own charcuterie made at his commissary in the Mission (seriously, how do they make pasta, charcuterie AND pastries with with just Shelton, Michael, Hamilton-Kidd and sous chef Adriana Fleming handling almost of the day-to-day duties for the whole operation?). For now, he’s offering a charcuterie platter sourced from elsewhere ($16) and a cheese plate ($17) with good friend Eric Miller of Mission Cheese helping as a fromage whisperer/advisor. A combination of the two ($20) is also offered. On the cheese side for the combo, Pt. Reyes Toma comes with the ever popular Cowgirl Creamery Mt. Tam and gooey, funky Comté from France. The cured meats include pâté de campagne, speck from Red Table in Minneapolis and sopressata from Fra’Mani in Berkeley. All of this is very daytime-oriented food that is friendly on the wallet and has a universal appeal for all ages. Who doesn’t love a good cookie or plate of pasta? 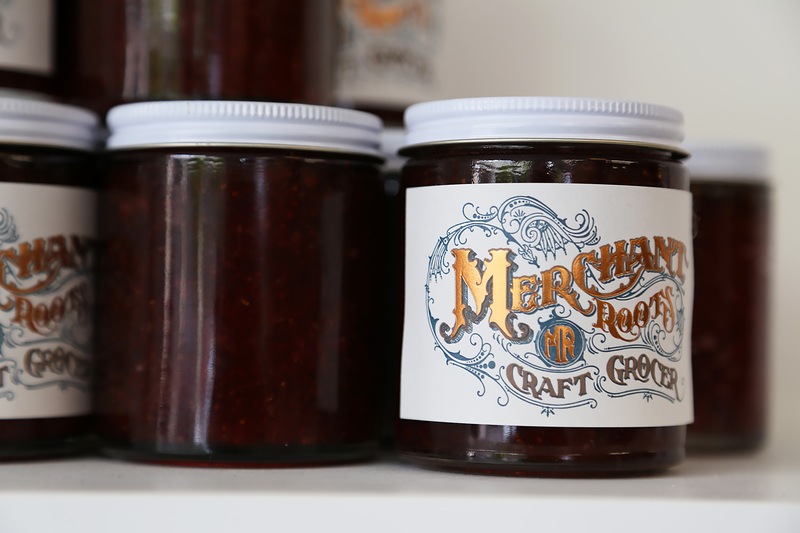 We’re all getting tired of restaurants and food makers calling themselves “craft” and “artisanal” but that is what sets Merchant Roots’ grocer component apart. There is that special homemade touch that makes nothing taste watered down. These are indeed artisan products and dishes by experts who know their way around a great doughnut and kale salad…and also know how to put on a lavish, avant-garde tasting menu feast. Yes, that’s where The Table at Merchant Roots comes into the picture, arriving in the next few weeks (probably in June). The Table is literally a monkeypod table that is used for casual communal dining during the day and will be an intimate eight-seat, one sitting dinner setting three nights a week. 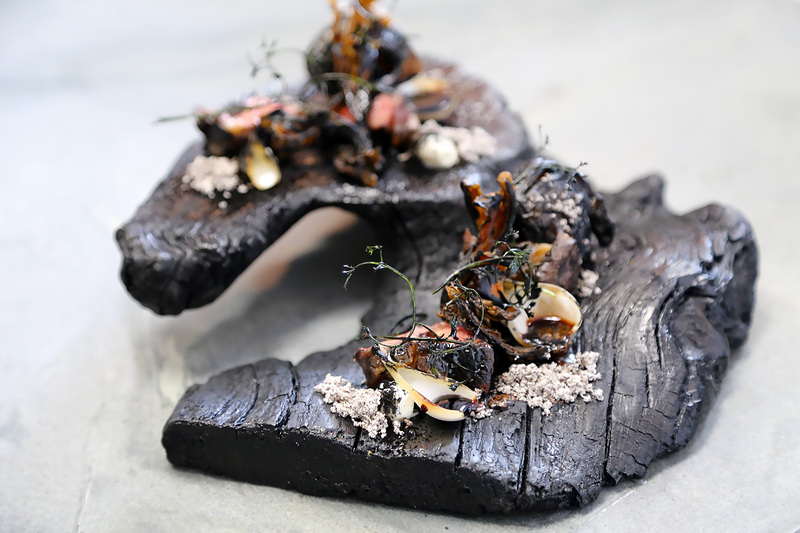 To give you an idea of how advanced these dishes are, one “Elements” course called “Fire” centers on charcoal-grilled dry-aged New York steak, offset by charred pearl onions, crispy maitake mushrooms, leek ash and sunchoke “coal.” That’s not all. The classic steak or prime rib sauces of horseradish cream and red wine demi-glace find their way onto the log. Yes, the log. The serving platter is probably even more noteworthy than anything for this one dish. Shelton made 10 of the log platters by heavily charring the gnarly wood over several weeks to the point that they were fully pitch black and then stained them to keep the striking, even haunting appearance in place. That is just one course on one short-lived menu, but is a great reflection of the ambition on display and the ample creativity. The other bonus worth pointing out is that the opening $110 price tag per diner, while not at all cheap, is far below the total for its peers. The size and price of the menu will slightly fluctuate but several will stay in this format. Future menu themes include “Vanity Fair,” featuring everything ornate and gold-plated, and “Mermaids” with each dish literally made from sea ingredients all the way down to a bread that seems like a sourdough-fish sticks crossover. It’s made of kelp paste, haddock pureé and coconut flour (no yeast, just coconut flour paste that is inoculated over time with indigenous yeast!). Clever? Mad scientist? Artist? Genius? Restless chef who is happy to be independent? Renaissance man? Shelton pretty much wears all those hats as Executive Chef/Proprietor and with Michael as Proprietress/co-pilot for the adventurous business plan. That’s the best way to understand how the grocer and The Table concepts both came about and why they can work in this particular situation. Look at their resumes and you’ll see how all of this can fit under one compact roof. Shelton is a trained pastry chef and was the lead Pastry Chef for Mountain View’s esteemed chez TJ. His original South Bay home region then continued as the base for his culinary experience with time on the savory side as Chef de Cuisine at the molecular gastronomy-centric Baumé in Palo Alto, followed by a short period as Executive Chef at (the now closed) Le Cigare Volant restaurant at Boony Doon Winery’s tasting room in Santa Cruz. 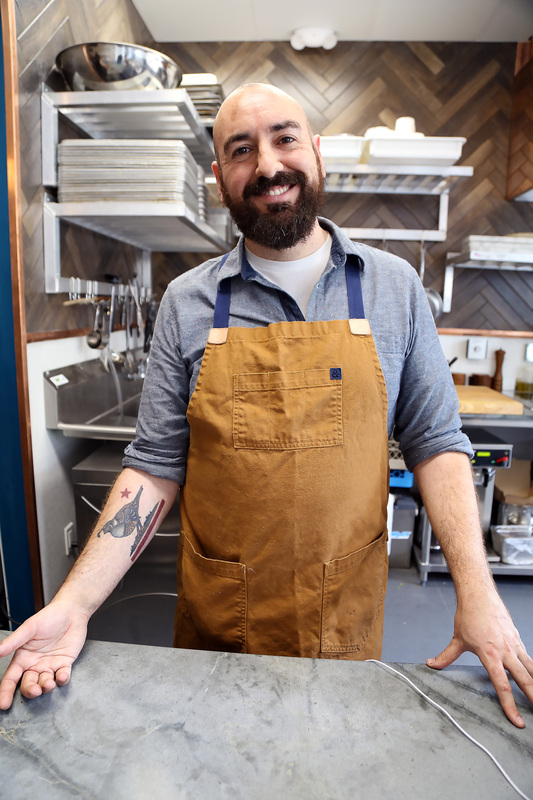 His permanent career and residential move to San Francisco led him to Polk Street where he was Executive Chef for the highly rated but short-lived Verbena and its short-lived tenure as Reverb Kitchen & Bar (it’s now Mezcalito). Michael’s background is more in beverages as a certified sommelier and includes time working at bars like The Thomas in Napa (since closed) and the sensational Kauai tiki bar, Tiki Iniki, in addition to restaurants with strong wine and bar programs like Mourad and Verbena/Reverb. But, she’s also gifted at a whole array of other food-oriented crafts and actually a certified cheese expert. 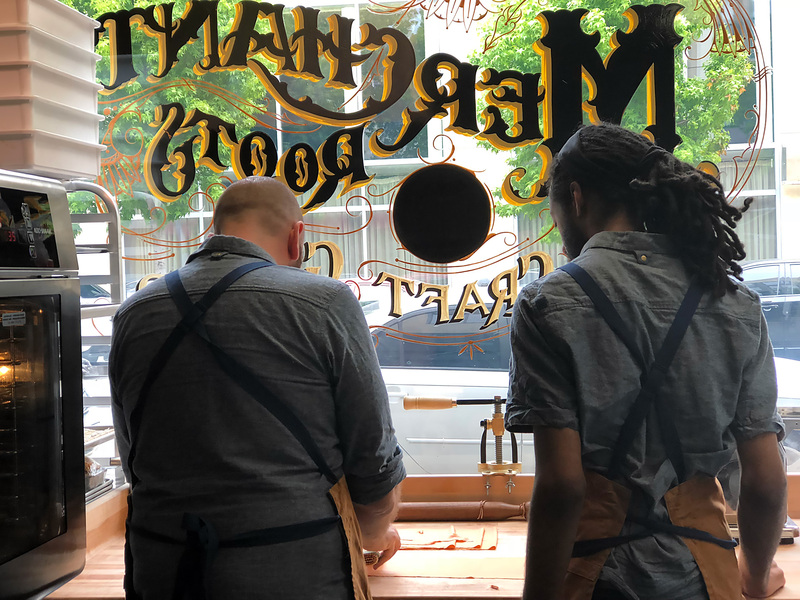 The idea for Merchant Roots’ grocer side has been in Shelton’s mind for many years but the wheels were truly set in motion after he and Michael worked 100 days straight at Reverb — only to see the restaurant then close. Both knew that a sustainable quality of life had to be part of the equation for their personal project, an idea that sadly isn’t seen much in the restaurant and bar industry. So, Michael thought about the three-night-a-week Table to go with the five-day-a-week grocer as a balanced solution with their personal lives (Michael has a nine-year old son) and diverse talents. Indeed, Michael’s chocolate chip cookie contribution may one day lead to a Cookie Roots spin-off but many of her contributions to Merchant Roots could honestly have their own spin-off. The most obvious, of course, would be the wine shop component. It will grow to have 84 labels of engaging wines from notable (mostly younger and less “famous”) producers in California, France, Spain, Italy and some of the lesser-known regions at home and abroad. Think of it as a wine-choosing app but…with the human concierge already making tough decisions for you. San Francisco isn’t lacking in great wine boutiques but several of the celebrated ones (K&L, Flatiron) can be daunting to navigate with too many choices and not enough help. Labels at Merchant Roots have standouts from the new California Wine front (Broc, Matthiasson) but also the equivalent upstart game-changers in Europe like Le Macchiole and Peter Later. Michael doesn’t delve into the pricey trophy wines of Napa and Bordeaux, and does keep value-minded options kindly in mind with a surprising number of enjoyable $10-$15 wines on hand. 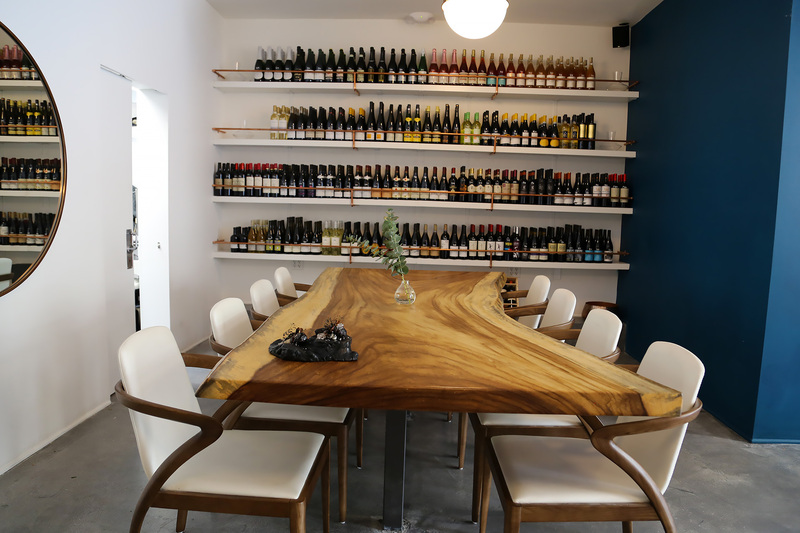 If you’re staying at the shop for lunch, a half-dozen of the wines are poured by-the-glass. The larder on the wall opposite is also largely Michael’s domain. She makes preserves (all $7) in all sorts of tempting bright colors and flavors that are already at the top of the very small list of San Francisco-made jams, marmalades and jellies. A jar of mandarin jelly combines satsumas and clementines, while the yuzu marmalade features citrus rind and Navel orange. Right now in the heart of spring, there’s a rhubarb-pear jam and a Meyer lemon jam featuring whole pulp in the mix for an extra sweet and sour punch. 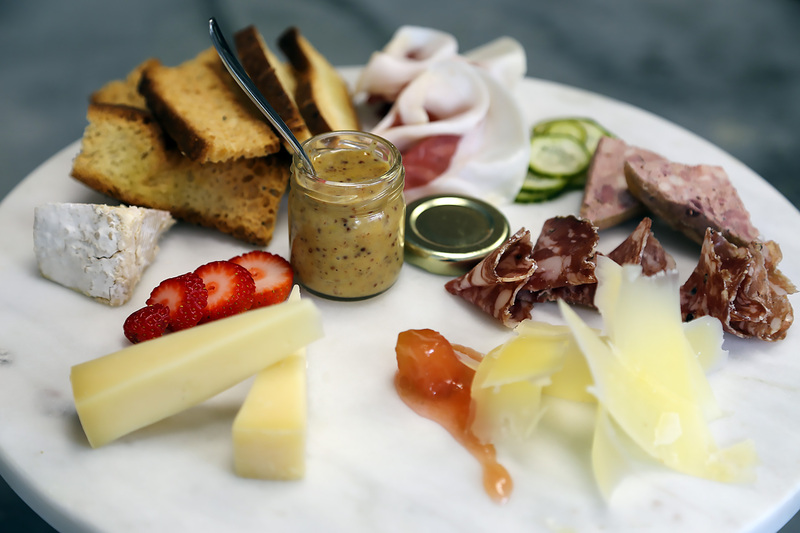 Hopefully those jams will be served on toast one day (this is San Francisco, after all) but for now you can at least find the rhubarb jam dotting the cheese plate. Then, there are the soaps. Yes, soaps. 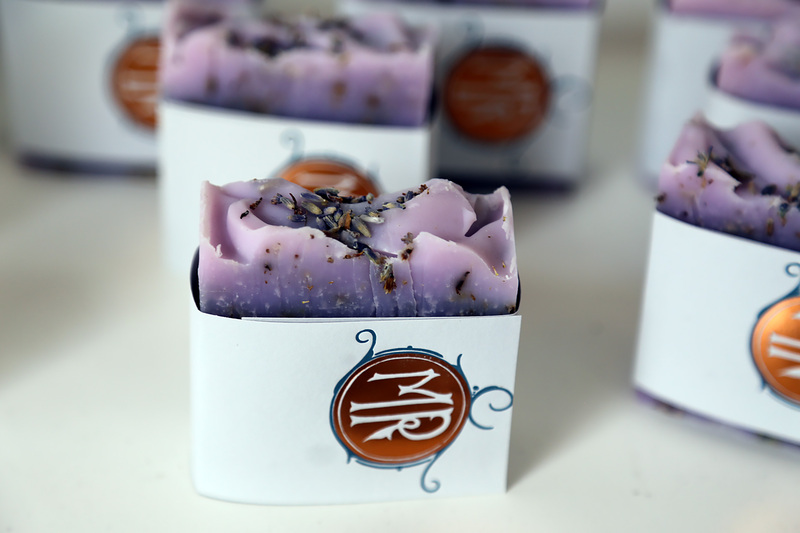 Michael cleverly uses all cooking quality ingredients (coconut oil, avocado oil for example) to make the intensely fragrant soaps that make up their own line called “Milk & Raven.” Dare we say that we almost want to eat them? 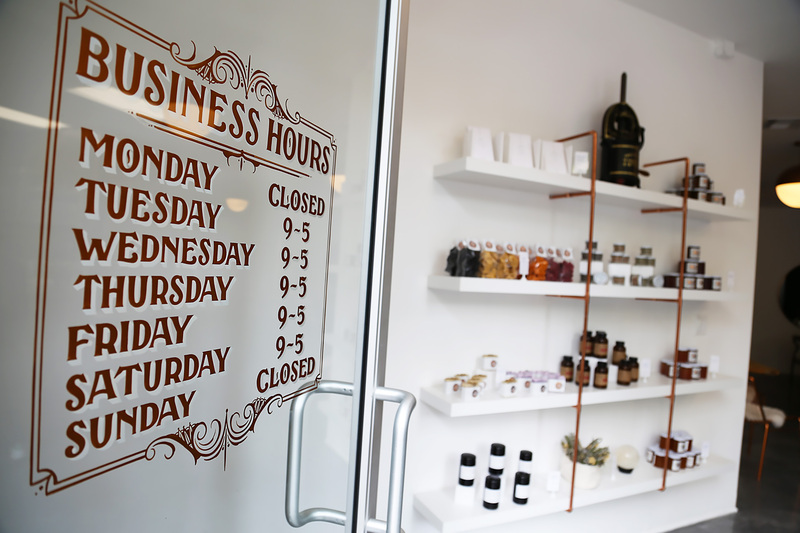 You’ll also find drinking chocolate at the larder, hailing from Santa Cruz. It’s one of the few things not made at Merchant Roots but don’t start calling out Shelton and Michael for this. The high caffeine, intensely concentrated flavors of the mixes are from Mutari Chocolate, a true master of the art and his products are hard to find in SF. 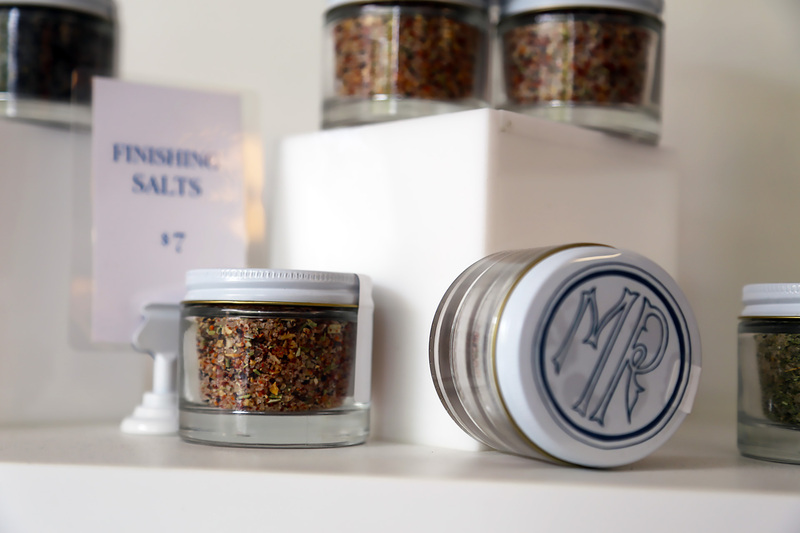 The larder’s teas come from Berkeley’s Leaves and Flowers and are available to be enjoyed in-house brews. It’s worth noting that coffee for enjoying only in-house comes from Red Bay Coffee of Oakland and there actually is a hidden espresso maker if you ask for a cappuccino. Yes, this might be San Francisco’s first espresso speakeasy. Merchant Roots’ home is as adorable as the concept itself, thanks mostly to a large woven fiber art piece (Instagram alert!) by local weaver Meghan Bogden Shimek. 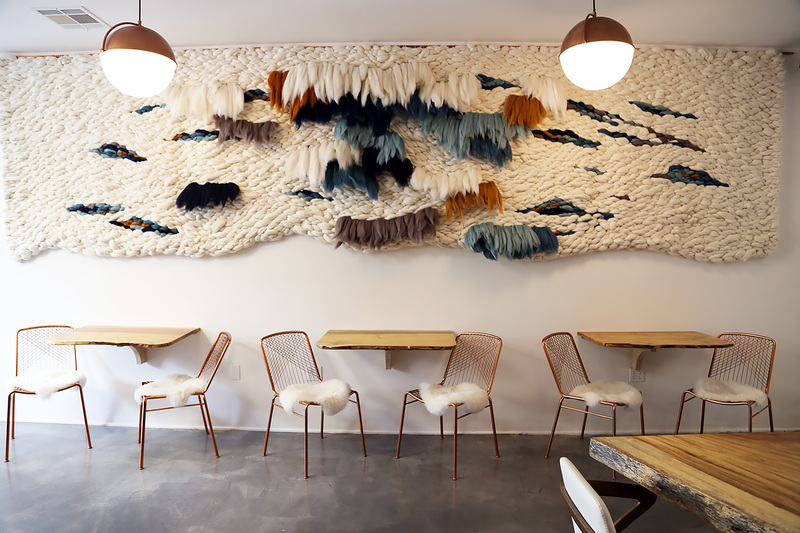 Foldable café tables are attached to the fiber piece’s wall (those tables will be collapsed for dinner service) and have extremely comfortable copper wire chairs draped with faux furs for sitting in. The Table itself resides between the art piece wall and the wine wall. Do note that The Table’s utensils won’t skimp on the luxurious quality with pottery by Berkeley’s Kiyomi Kiode and ferociously delicate and refined wine glasses by Sophienwald of Austria. And, yes this doesn’t seem like a WiFi kind of place and you’re right about that. Leave the laptop at home or bring the hot spot. It’s definitely not Shelton and Michael’s fault. The over yearlong delay from the original ETA is a smorgasbord of San Francisco restaurateur challenges. One that diners don’t often think about played a key part in adding the delay — construction crews favoring the thicker wallets of wealthier investment-backed restaurants (we won’t name names). Is this where San Francisco dining is going? Can independent restaurants be helped? This part of Fillmore Street was historically filled with black-owned shops and restaurants, along with the jazz clubs that made this the Fillmore Jazz District. Except, there are basically no jazz clubs or black-owned businesses here anymore. One of the last ones of the corridor, Black Bark BBQ, had to relocate. The San Francisco Chronicle’s Jonathan Kauffman just wrote an excellent profile about this neighborhood and this sad realization for the Fillmore’s demographics. It’s an unfortunate change for the neighborhood, albeit one that is very reflective of Divisadero just up the hill. Both are getting increasingly gentrified like their glossy nearby peers of Hayes Valley and Fillmore in Lower Pacific Heights. Yes, this is San Francisco 2018 and we could talk all day about gentrification. 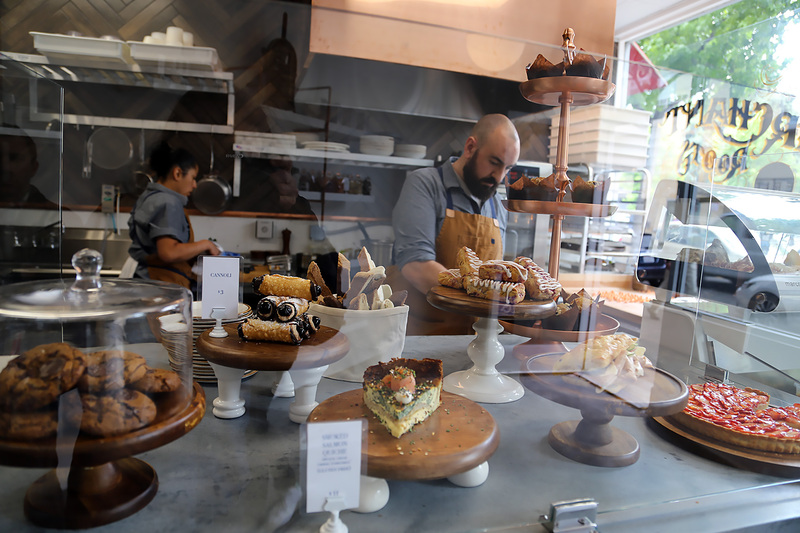 At the same time, this is a story about how the newer food businesses on Fillmore all started as small business concepts and have grown into thriving projects that should be celebrated. Wise Sons, Boba Guys and State Bird Provisions all weren’t glitzy or deep money-backed when they first opened. Fat Angel was the very first of Hi Neighbor’s restaurants and still isn’t very well-known beyond its regulars. Avery’s chef-partner Rodney Wages went through the ringer at many top kitchens in order to start a pop-up that morphed into Avery. These restaurateurs worked hard to become names known citywide. Shelton and Michael are no different — remember that 100 days we mentioned? They sure know this industry all too well. On the side, the two have even been offering doughnut and pasta making classes with Cozymeal not just because it’s fun but also to make money. (Full disclosure: this writer took a pasta making class from Shelton and is now at least not awful at the difficult art). They also do high-volume catering and various other projects because, hey, when your business isn’t making money in this pricey city, how do you make money? Luckily, both have no shortage of talent, imagination or desire to fulfill their hopes. Shelton even has a tattoo of Merchant Roots’ 1365 address in roman numerals (MCCCLXV) and a tattoo of a quail, the California state bird. The chef certainly really cares about this project and where this project calls home. Restaurateurs and entrepreneurs like Shelton and Michael champion two universally beloved things in this city, whether you’re a techie millennial or lived here 55 years: bighearted small businesses that really focus on doing a few things and doing them extremely well; and clean, high quality food. 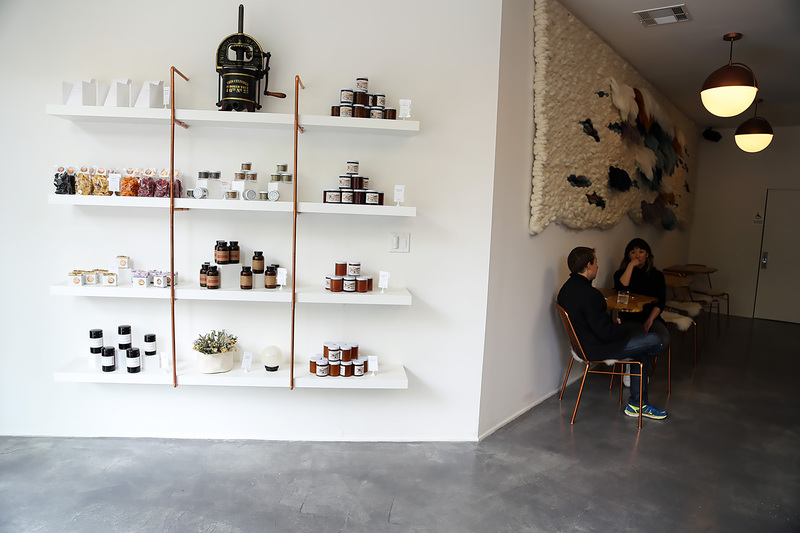 A few modern tastes find their way into Merchant Roots (kale!) but there’s also a circa 1900 era vintage sausage stuffer and a small town, everybody is welcome vibe. It’s delicious, upbeat and family-friendly — heck, even dogs will appreciate the upcoming unveiling of peanut butter raviolis for them. Finally, Shelton and Michael are doing what they want to do and luckily for diners, they do it really, really well. You can’t help but root for them.